The mission of White County Emergency Management is to provide a comprehensive and aggressive all-hazards approach to homeland security and disaster initiatives, mitigation, preparedness, response, recovery and special events. The purpose of our mission is to protect life and property and to prevent and/or reduce the negative impact of natural and man-made events in White County. Even before the unthinkable happens, emergency management works to reduce the impact of a disaster and plan the response in order to save lives and make White County a safer place to live. Emergency Management helps the community analyze the hazards that may affect them and develop mitigation strategies and emergency operations plans. When disaster strikes, sometimes the destruction is so severe that the County’s responders are overwhelmed. That is when EMA steps in to help and may ask the Governor to declare a State of Emergency in order to make state resources available to the afflicted area. It can take years for a community to recover from a disaster, and EMA is there every step of the way. Whether coordinating clean-up efforts, educating victims about available relief programs, distributing disaster relief funds, or providing communities with the tools to identify public structures in areas that are at risk of damage, EMA is ready to address the consequences of disaster and reduce future risk. Families should be prepared for any type of hazard that could affect their area. The best way to do this is to develop a family disaster plan. View this video and the steps below to make you sure and your family are prepared for an emergency. Remember to also inquire about emergency plans at work and school. 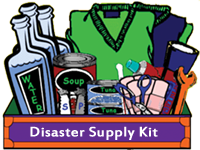 This kit is a group of items you may need during a disaster. By having these items grouped together, you can quickly grab your kit and leave if an evacuation is ordered for your area. Make sure to have food and water for each person and your pets for at least 72 hours. Sometimes emergency workers can not reach you immediately and you'll need to survive on your own. Keep in mind that basic services such as electricity and water may not be available. Make sure that your kit includes items that will help you manage through these lose of services. Disasters can be hard on adults and children - make sure to include some comforting items in your kit, whether it is a teddy bear or a game for a child or comfort/stress foods for adults. 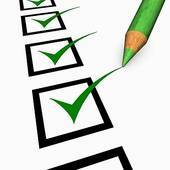 Visit FEMA at Ready.gov for a downloadable emergency supply kit checklist. Learn what hazards affect your area. Contact the National Weather Service office in Peachtree City, your local emergency management office, or a local Red Cross chapter to learn which hazards can affect you. Make sure you know what to do when severe weather strikes. If you get separated from family, make sure you have a place to meet or have a out-of-town contact to let know you are ok.
You can fill out your Family Emergency Plan through Ready.gov. Involve children in the plan making process. See how Sesame Street can help kids be ready for a disaster! Make sure that you get watches, warnings and advisories when severe weather strikes. These are just a few ways in which to get watches, warnings and advisories - remember it's important to receive alerts and warnings multiple ways. Have a NOAA Weather Radio. Make sure it's plugged in, turned on, and have extra batteries just in case the power goes out. A key benefit of NOAA Weather Radio is it will alert you while you are sleeping so you can take shelter. Check with your local emergency manager to see if there are sirens in your area. Learn the policy specific to your area and remember that sirens are an outdoor warning system and are not designed to be heard indoors. Local television and radio stations also broadcast (scroll) severe weather watches and warnings. These scrolls are not controlled by the NWS. *Portions of the information above is from FEMA and the Red Cross. (CERT) program educates people about disaster preparedness and trains them in basic disaster response skills, such as fire safety, light search and rescue, and disaster medical operations. Using their training, CERT members can assist others in their neighborhood or workplace following an event and can take a more active role in preparing their community. Thursday evenings, 6 to 9 pm. Include your name and telephone number. The purpose of the Local Emergency Operations Plan (LEOP) is to minimize the loss of life and property caused by a disaster. It is applicable to all elements of the county government and the private sector engaged in, or acting in support of, emergency operations. It prescribes the course of action to be taken by county departments to protect the lives of the population and the management of human and material resources during and after emergencies. This playbook describes how communities organize and align key functional roles and responsibilities to work collaboratively with other community, State, and Federal partners, the private sector, and nongovernmental organizations (NGOs) to ensure that their residents and essential services rapidly recover. The following sections describe community roles and responsibilities, response structures, and how communities work with key partners to provide an effective, unified response.